Christmas is coming to Governors Harbour – and fast ! Last Thursday we had our regular Christmas pizza Party at Tippy’s with the children and staff from the Exceptional Learners Centre. Sadly the fantastic students from the US University who have been working there had to leave before the party so it was just Mr Bill Holland and Ms Dolly Petty from the staff who were there. Our fabulous right hand man Cecil ‘Boot’ Petty with students on the back of the truck….. Plenty of all of the usual – pizza, sodas, ice cream, hats and presents plus a wonderful performance by the students of “ Go Tell it on the Mountain” which everyone who was lunching at Tippy’s got to enjoy ! Team picture including my Mum – far right, Good friends of the Exceptional Learners Donna and Stuart and all the rest ! Come the weekend it was time to start digging out the decorations and getting the house all gussied up. This is the first year that I haven’t put real Christmas trees outside all of our rental houses – I saw some LED lit twiggy trees in the sales last January and decided to go that way instead. They look great and are a) much cheaper than buying a real tree every year and b) use less power as they are LED and c) very designery !! Boot putting up the icicles on our house. Next we started on Buena Vista. 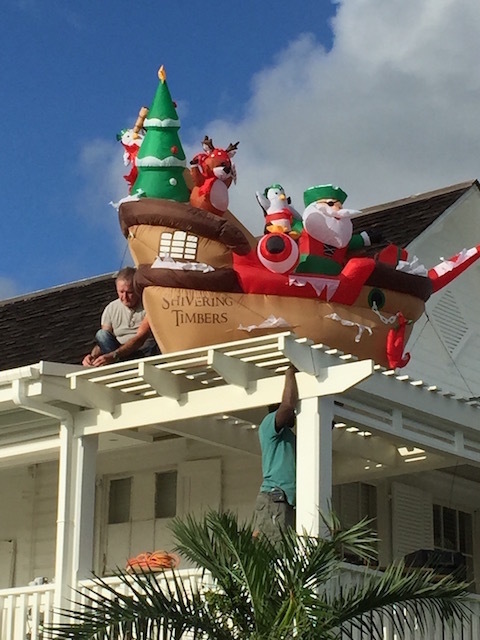 As you will have seen we love an inflatable Christmas item and this year we added to our collection with a Christmas Pirate Santa and his ship – Shivering Timbers as well as a Star Wars Christmas Yoda – hopefully we will know when to stop ……. I was delighted to find a useful solution to all those sets of Christmas lights that only partly work – I plonked them all in a glass vase and switched them on – and you don’t see the ones that don’t work – just a lovely mass of lights. What to do with all those half strings of Christmas lights…..
Now it’s writing Christmas cards to get sent off to the UK – I get them mailed from the US as it takes weeks and weeks from here in Eleuthera…..
Merry Christmas! I just love all your decorations too! What?? No photo of Yoda Santa? A real disappointment! Happy Christmas and much love! Not sure how he slipped through the net !!! It was a treat to partake in this annual event! Kathy and Bob get as much a kick out of selecting gifts as giving them. The pizza was yummy too! So lovely to have you there…. Last year’s gift of date palms have grown amazingly, have they not? They have settled in beautifully and do look very happy ! Thanks for noticing….